We have two different stories this month from the burgeoning cooperative movement in North Carolina. First, our good friends at the Electric Violin Shop were recently featured on UNC-TV in a lovely video, which gives a history of EVS’ conversion to a worker co-op and a great look into the incredible “amplified strings” they sell. The video has already amassed over 5000 views on Facebook. Check out the screen-cap above that includes a mention of LEAF and Shared Capital Cooperative, our lending partner. Elsewhere in North Carolina, our borrowers from the Durham Co-op Market hosted a special guest in August: President Bill Clinton! He was in Durham as a planned stop as part of the Hillary Clinton campaign trail. Before his speech, he took the time to shop at the co-op: watch the video here! 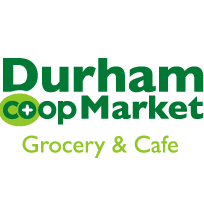 LEAF helped finance the Durham Co-op Market when it was first opening in 2013: we’re so proud of how successful they’ve been!